One of our favourite meals is Korean Beef. It is super easy and can be served in a bowl, on a tortilla, on a lettuce wrap or on a plate with rice and beef on top. I also use ground beef, chicken or turkey for this as well beef flank steak. All is prepared the same. Lettuce or tortillas if making wraps. Heat vegetable oil in a large skillet over medium high heat. Add garlic and cook, stirring constantly, until fragrant, about 1 minute. Add ground beef or whatever meat you are using, and cook until browned; drain excess fat. Stir in sauce and green onions until well combined, allowing to simmer until heated through, about 2 minutes. Serve immediately, garnished with green onion and sesame seeds, if desired. If I am using a flank steak, i serve it on a plate with rice and the steak over top or in a tortilla. 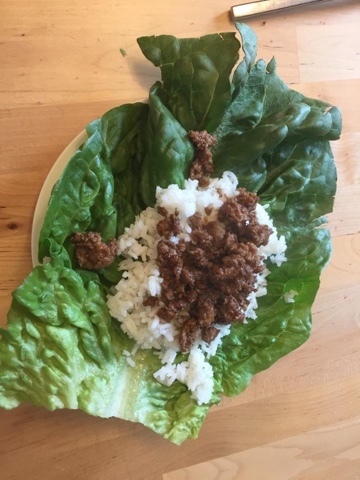 If I am using ground meat, I use the bowl method, the tortilla and lettuce wrap method too.